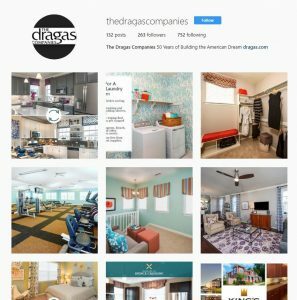 For client The Dragas Companies, a new home builder and developer in Virginia Beach, we perform a full slate of strategic marketing services including branding, content marketing, social media, advertising, campaigns and more. One of our first projects for The Dragas Companies was to revitalize and refresh the builder’s brand, which lacked consistency. With nearly 50 years of experience in the Hampton Roads market, Dragas has built a solid reputation for building great homes and communities, taking care of its customers and giving back to the neighborhoods in which it builds. With a target market including millennials and first-time home buyers, Dragas was searching for a color scheme that would appeal to this demographic. With 10 different colors being used on the website, there were plenty of options to choose from! In partnership with another agency, we selected primary colors that incorporated the cool greens and blue tones that millennials favor. Black and teal were chosen as the main Dragas colors, with accents of orange and bright blue to be used as needed. After selecting the colors, branding guidelines were created that offered clear explanations for how to use the Dragas logo, where the colors could be used and how they could be mixed. With these new guidelines, the Dragas brand is now even more recognizable and iconic than it was before. After updating the branding, The Dragas Companies was ready to update its community signage. The signage that was in place at the time featured the old branding, and it incorporated word clouds that were hard to read while driving by. Dragas desired clean, simple signage that was eye-catching and easy to read while driving. Dragas also had beautiful photography showcasing its communities and product that were not being utilized on signage outside the community. The newly created signage featured teal and white, two colors that provided great contrast. In addition, we incorporated simple text highlighting directions and price points, and added photos to the larger signs that were sure to catch the attention of potential buyers. In addition to these special projects, we provide The Dragas Companies with a yearly strategic marketing plan that is comprised of content for the blog and public relations, social media posts, and digital and print advertising. Each month, we craft multiple original blog posts for the Virginia Beach-based builder that incorporate search engine optimized content on topics that include community news, local events, design trends, promotions and incentives, philanthropic news, economic trends and more. The content is unique to Dragas and written to attract the attention of home buyers, while also assisting in the SEO efforts provided by Dragas’ SEO team. In addition to blog content, we also craft quality public relations content as needed to help Dragas achieve placement in local and national publications. Our monthly marketing efforts also include social media efforts across all of Dragas’ platforms. The builder can be found on Facebook, Twitter, Instagram, Pinterest, LinkedIn, YouTube and Google+. Each month, we create a complete content calendar detailing every post, tweet and photo that will be posted on the social media sites for the coming month. Posts include popular hashtags such as #FollowFriday or #ModelHomeMonday, photo albums and other visual elements to increase their reach and they ask the audience to engage in some way. In addition to our planned content, we provide timely posts and information as it becomes available while monitoring engagement and interaction across all of the sites. Our social media efforts for Dragas also include Facebook advertising that attracts traffic to the website, boosted posts and sponsored videos. On average, Dragas spends just $0.02 per view for its video ads, and enjoys a click-through rate as high as 11 percent on its boosted posts! Since we started managing Dragas’ social sites, the following on every platform has increased. The impact of our work can be seen specifically on Facebook, where Dragas’ audience has grown by more than 20 percent, the average number of posts sent each month has increased by 118 percent, impressions have grown by nearly 50 percent on average each month, and most importantly, engagement has grown by a whopping 245 percent! Another monthly project that we work with Dragas on, in conjunction with another agency, is community advertising. Each month, we create two to four unique direct mail postcards advertising Dragas’ communities. These postcards drive traffic to the community model homes, as well as to unique landing pages on the website. The postcards are then converted into a variety of digital assets, including eblasts, Facebook ads and social media posts, which all work together to provide consistent messaging across various platforms to reach all of Dragas’ target market.